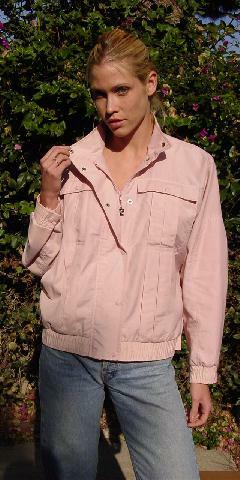 This vintage baby pink jacket is 27% nylon, 47% polyester, and 25% cotton. 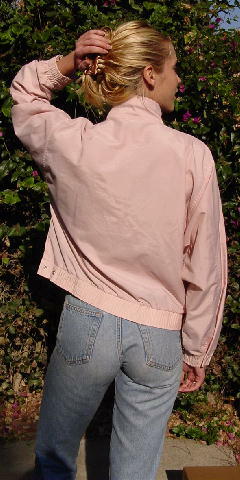 It has 2 large flap-snap closure breast pockets and 2 snap cuff closures. There is a front zipper closure as well as an over-flap closure with 6 snaps going all the way up to the top of the neck. It has 2 large front curved side pockets. It has lots of front detailing and a little logo silver zipper pull. shoulder to bottom of waistband 22 1/2"
side to side at bottom of waistband 19 1/2"
shoulder to bottom of armpit opening 13 1/2"